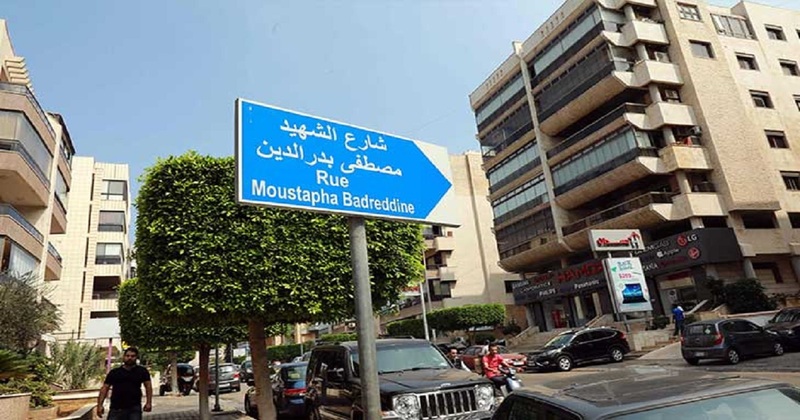 الصفحة الرئيسيّة	>> Why Did Hezbollah Choose this Street to Name After Badreddine? Why Did Hezbollah Choose this Street to Name After Badreddine? Many question arose from this Ghobeiry Municipality decision, but very few answers are left for the imagination. According to judicial law, a deceased person may not be sentenced. That is why it is not expected that the sentencing by the special Lebanese tribunal around the Hariri assassination will include verdicts on the late Mostafa Badreddine who was assassinated in Syria in 2016. One might expect that Hezbollah allies will retaliate against the allegations against Badreddine presented by the special tribunal by raising banners in his name, and the decision of Ghobeiry municipal council (comprising of joint Hezbollah and AMAL figures who by virtue of a joint electoral campaign dominated the municipal elections) to name a street after Badreddine is also understandable. Badreddine was involved in well-known security operations such as the assassination attempt of the Prince of Kuwait in 1985 which lead to his incarceration for 7 years, and other unknown operations privy to Hezbollah alone. He is considered one of Hezbollah’s greatest martyrs whose reputation should be clear and untarnished by external allegations and attacks; that also is understandable. To wonder what happened that the Ghobeiry Municipality decided to change one of its street to Mostafa Badreddine Street is futile since Hezbollah refuse to even discuss the decision. They are even unwilling to justify the decision of selecting the street closest to Beirut which still suffers from the tragedy of the Hariri assassination; instead of selecting any possible street in the south, Bekaa, or any inner street in the Ghobeiry municipality. However, what can be said about this provocative step according to many Lebanese while is also considered by Hezbollah supporters as a gesture of respect and sanctification to the martyrs of the party is one crucial question. Why did Hezbollah choose a street so close to the Kuwaiti embassy, which accuses Badr al-Din of trying to assassinate its Prince during the bombings in Kuwait in 1985, and next to Rafik al-Hariri’s governmental hospital in Beirut, who Badreddine was recently charged by the special tribunal for leading the assassination operation against.